An attractive broadside example of Frank Dorn's iconic 1936 pictorial map of Beijing or Peking, China. 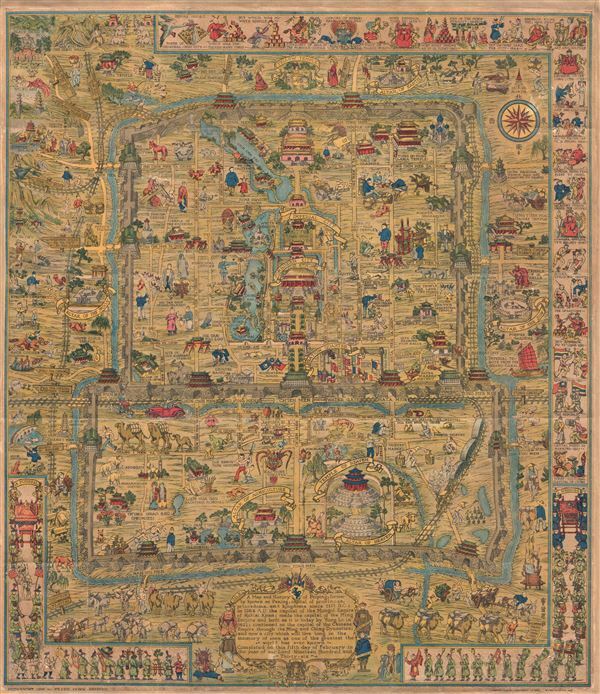 Considered one of the great maps from the Golden Age of Pictorial Cartography, this map covers all of Beijing as contained within the old city walls as well as parts of the surrounding area. Dorn combines cartographic accuracy with a dense array of pictorial vignettes intended to illustrate this history of Beijing. The elaborate border takes the form of a basic chronology of Beijing, with illustrated annotations such as 'Decadent Period under the Ch'ings' and 'Capital of Kublai Khan 1264.' This map was published in Tientsin-Peiping, China by the Peiyang Press. Good. Has been professionally cleaned and laid down on archival paper. Remargined.